From as early as 1982, The Gleaner presents records that bear witness to the ongoing love affair between Lorna Goodison and her native homeland. Goodison’s poems have paid homage to, offered criticism of and often craftily described and deconstructed the beauties and distresses of her Jamaican world. Her poems tend to give insight into a way of life that defies definition, and will only yield to the most thoughtful, meticulous descriptions. 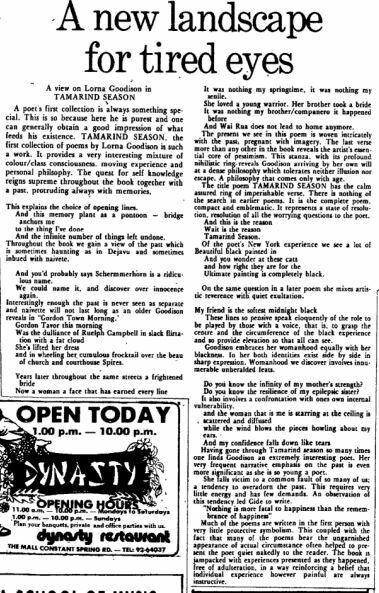 Below, you will find one of the first newspaper articles, published in The Sunday Gleaner of October 3, 1982, critiquing Lorna’s first poetry collection Tamarind Season. The article starts by saying that “A poet’s first collection is always something special”, saying Goodison’s first work provides “an interesting mixture of colour/class consciousness, moving experience and personal philosophy”. The reviewer surmises that Goodison is “an extremely interesting” poet, noting that her “very frequent narrative emphasis on the past is even more significant as she is so young a poet”. Fast forward to 1999, and Goodison is no longer a young poet. By this time, she has become a lecturer in poetry at the University of Michigan, and another esteemed Jamaican poet, Professor Edward Baugh describes her as “a most highly internationally acclaimed poet who was once again blowing through like a breath of fresh air. Her imagination opens up and goes round wonderful corners”. He makes this statement at the official launch of another collection of poems by Lorna Goodison, titled Turn Thanks (Gleaner article, Monday, July 26, 1999). Between Tamarind Season and Turn Thanks, Goodison has published five other poetry collections, the most acclaimed of which is I Am Becoming My Mother – a hauntingly beautiful repository of poetic magic that captured the Commonwealth Writers’ Prize. On why she decided to call her seventh poetry collection Turn Thanks, Goodison tells her audience: “One of the tenets by which I live is gratitude, because the opposite, envy, is a corrosive thing.” Wise words from a well-loved wordsmith.